Home News & Opinion From the Magazine Would grocery shopping with a nutritionist help people eat healthier? Would grocery shopping with a nutritionist help people eat healthier? Kristina Lewis, a medical researcher with Kaiser Permanente of Georgia, snagged one of the inaugural awards from the New York Academy of Sciences’ Sackler Institute for Nutrition Science. Lewis, a practicing doctor as well as researcher, hypothesizes that information doesn’t translate from nutritionist to patient, rendering the benefits of seeing a dietician “minimal.” Instead, she has a proposition: Patients might change their eating habits if their sessions with nutritionists were conducted in grocery stores rather than clinical consulting rooms. Thanks to her $50,000 Sackler grant, she’s testing this theory in a study. In the meantime, we asked her to weigh in on supersize sodas and the economics of nutrition. 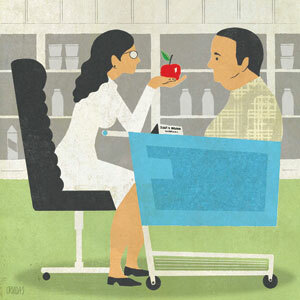 Why might shopping with a dietician be better than visiting her office? This study’s purpose is to test if nutritional advice in context is more effective. Think of it in terms of exercise: If I wanted you to become more physically fit, would you be more likely to exercise if I sent you to work out with a trainer in a gym or if I had you meet the trainer in my office to talk about going to the gym and look at pictures of equipment? The latter may not be the best method to modify behavior. I see nutrition advice in the same light. I want to go where people make food-purchasing decisions—the store—the same way you teach someone to exercise in the gym, to determine whether delivering advice at the point of food purchasing will help patients learn better and become more likely to follow that advice. What made you specialize in obesity research? I went to medical school in New Orleans; that’s where I really started becoming interested in obesity. People struggled, and the food environment was so bad. How can someone change behavior when the whole environment around them is set up to fail? What are environmental determinants of obesity? They vary by location. Extensive research has been done on the “built environment.” Are there parks? Is it safe? Is there access to healthy food? Another layer is the culture around eating. Finally, policy: How do we legislate what’s in our food supply? On policy, what about sugary drinks? There are people who think sugar-sweetened beverages are the major contributor to the obesity epidemic. I’m not sure we know enough to say that, but certainly a daily large sugar-sweetened beverage is not a good thing for people trying to lose weight. Has the recession contributed to obesity? It’s possible. Healthy food tends to be more expensive. That said, a factor contributing significantly is we eat most of our meals out.